Yes, You Can Improve Your Memory! By Jeffrey M. Guarino, M.D. How do you know if you or someone you love is simply a bit forgetful or experiencing a serious memory problem? With age, it’s natural to wonder if forgetfulness is an early sign of a memory disorder. At the Swank Memory Care Center, we are focused on caring for individuals with diagnosed memory disorders, as well as their families. This includes education and tips on memory care. Here are 10 simple ways you can maximize your memory without the use of medicine. Keeping your body active is one of the best ways to protect against memory disorders. Brisk walking, riding a bike, and swimming or exercising in a pool are all low-impact ways to get your body moving. A balanced diet of whole grains, lean meats, lots of fruits and vegetables and healthy fats, such as fats found in fish or nuts, is associated with lower rates of memory disorders. Unhealthy saturated or trans fats, such as fats in fried foods and processed foods, may increase your risk of developing memory problems. Naturally occurring antioxidants from healthy sources, including blueberries, strawberries and avocados, also may be helpful in preventing memory loss. Drinking too much alcohol can cause short-term and long-term issues with memory. Limiting drinking to one glass of wine with dinner can help avoid this damage. Smoking causes numerous health problems, including increasing the risk of developing memory disorders. Quitting smoking is one of the best things you can do for your body and your memory. High blood pressure can increase your risk of developing memory disorders. Limiting your use of salt, eating a healthy diet and maintaining an active lifestyle can help lower blood pressure. Keep a check on your blood pressure readings and see your primary care doctor if your numbers are elevated. Avoiding isolation and socializing with others may help preserve memory. Get out of the house and interact with other people: go to church; join in activities at the senior center; dine out with friends. Keep your brain active by engaging in activities that promote function such as reading, doing puzzles or playing bingo. Avoid extended periods of watching television. Restorative sleep is crucial for healthy brain function. Set yourself up for a good night’s sleep by not watching television in bed, keeping bright or LED lights out of the bedroom and limiting caffeine late in the day. Mood disorders such as depression or anxiety can negatively impact your memory. Keep an eye out for symptoms of depression, including decreased appetite, insomnia, low energy and chronic pain. If you think you are depressed seek help from a licensed counselor or medical professional. Some commonly prescribed medicines have potential side effects of confusion or memory problems. Discuss your current medication list with your primary care doctor. Be sure to review both prescription drugs and over-the-counter medicines. Sleep aids that contain diphenhydramine also have been known to cause confusion in older adults. There are a lot of unproven and unregulated supplements on the market that claim to improve memory. But there is no evidence that they work. Take a vitamin supplement if your doctor has recommended it for a nutritional deficiency, but save your money on supplements that claim to boost your memory – use it towards a gym membership. 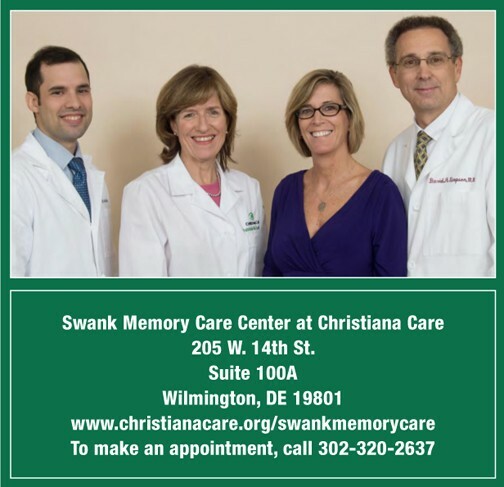 If memory lapses are interfering with daily life for you or a loved one, call The Swank Memory Center to learn more about how we can help or to make an appointment. You do not need a referral from your primary care physician. Jeffrey M. Guarino, M.D., completed his family medicine residency at Christiana Care and completed a fellowship in geriatrics at Thomas Jefferson University. Dr. Guarino has presented at geriatric medicine conferences and has been published in the Journal of the American Geriatric Society. He also is active in the local community, teaching and volunteering. To make an appointment or to learn more about the Swank Memory Care Center call 302-320-2637. ← Previous Story What Causes Unusual Swelling In The Body Following Breast Or Ovarian Cancer? Next Story → Helping Delaware Hear Better!